You would think that with two sons in college and working and with one son who is, for all practical purposes, finished homeschooling and is also working , I would be feeling like life is getting less complicated. It will help when we have another car. We've been down one since that unfortunate event in the Menard's parking lot. (Can I just take a moment to say, "Sven, I miss you!") Jonathan, Andrew, and I share a car. Or rather, Jonathan and I share a car, and I chauffeur Andrew. And then there's my job. Which I love. A lot. If I didn't, I would quit, because last year it cost us more in taxes than I made, so it's really more like a hobby. But, I will just think that I am really caught up--or even ahead--and then things happen. Like musicians. * Or Sundays unobserved in recent memory. And this always happens during holidays when I have extra stuff to do in the rest of my life. So I am doing something that is going to shock those who know me well. I am going to simplify my life by planning our during-the-week meals. Starting after the holidays, Monday will be roast chicken and vegetables. Tuesday will be something with ground beef. Wednesday will be pasta or some take on mac & cheese. Thursday will be soup. Friday will be left-overs/fend-for-yourself night (since I'm usually the only one here.) On the weekends I will continue to cook what sounds good to the hubby. I think that this plan will simplify my grocery shopping for the next couple of months. It will cut down on food waste. It will save money. The leftovers will be used. But it still leaves me room to make a dinner that will please my palate any given night. * I LOVE MUSICIANS. I love it when they play their lovely music. But they tend to complicate my job. Not mentioning any particular names here. **REO Speedwagon, where are you when I need you? This could work on a Tuesday. Sweet potato shepherd's pie. I know that some of you are going to think that I'm crazy, but this has been bugging me. I want to go someplace that requires me to dress up. Really, really dress up. We used to have some fancy holiday events to attend for Colin's job. At one time there were some fairly formal events for the Bach Collegium. But since Colin's job left town there are no more parties or events, and the Collegium events are far more ordinary than they used to be. I dress nicely for church, concerts, the theater, and any other chance I get, but I want to get REALLY dressed up. Long skirt, sparkly jewelry, cute little clutch bag, the whole bit. But I still want an opportunity to get really dressed up. Last year I saw this hook rack on Anthropologie's website. I liked the idea, but I knew that my hubby could make me a rack for way less than $88. 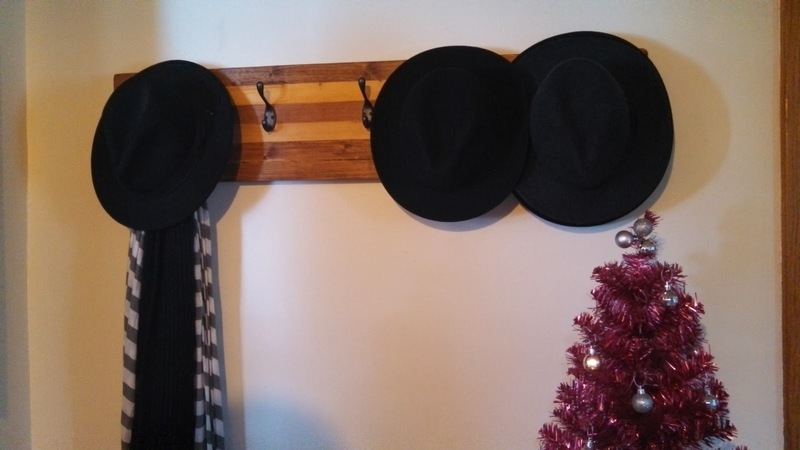 We spent about $22 on wood and hooks, and used stain from several old cans in the garage. It turned out exactly as I hoped. 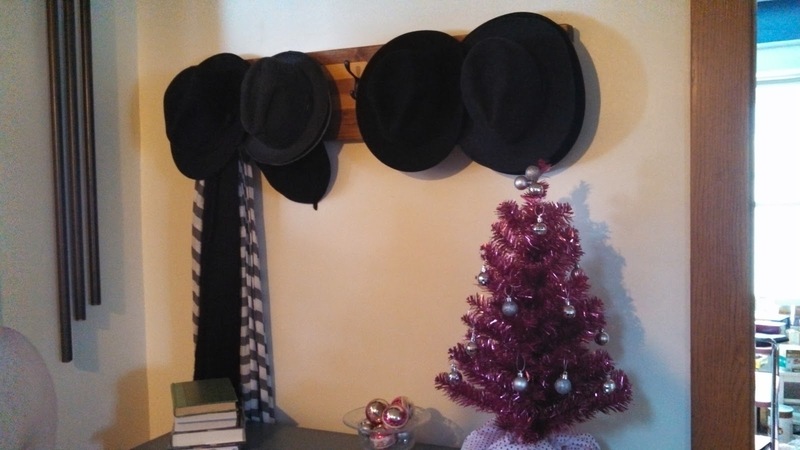 Since the men in this house are regular hat wearers, this is a really, really useful thing to have. 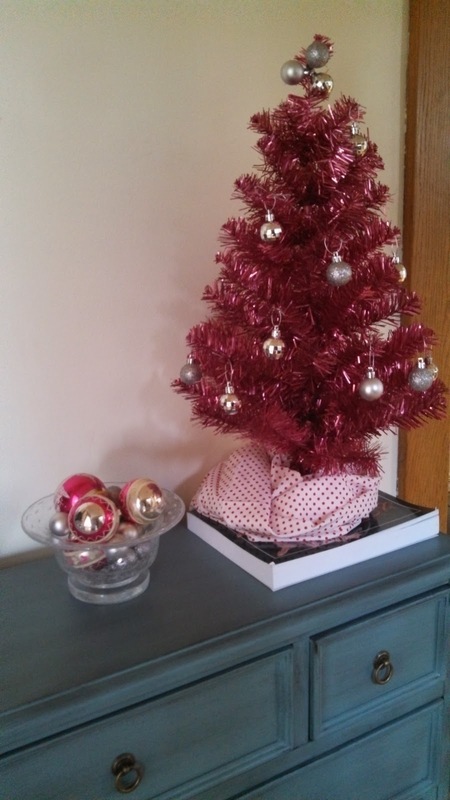 Really, I just fell in love with this little tree when I saw it at Target, but what better time to put it up?! What a reminder it will be to rejoice! I don't know if there's anyone else who starts feeling a bit contrary around this time of year, or if it's just me, but all of the push to spend, spend, SPEND, makes me want to go make some homemade gifts and send off a check to World Vision or Heifer, International. As anyone who knows me knows, I'm not averse to spending money. At all. I enjoy shopping. I like nice things. I love to buy gifts and often pick up little things that I think that the people I love will like here and there during the year. But, boy do I hate the constant inundation of ads in my email, my mailbox, and on my radio for DISCOUNTS!, LAST CHANCE!, BUY STUFF! I can't imagine thinking that my buying RIGHT NOW is so important that I encourage retailers to open on national holidays, causing thousands of moms and dads, sons and daughters, to have to miss holiday time, often with family who have traveled far to be there. I can't imagine believing that it is so vital that I get my hands on some discounted piece of made-in-China gadgetry that I will trample other people to get to it. Or that it is so necessary that my child have a particular toy under the tree that I will engage in a hair-pulling fight to ensure its presence. Don't get me wrong. I'm not one of those, "The world has ruined Christmas" people. Sometime the second week in December or so, when the furor of bargain-grabbing has subsided, I will dress up and go to the mall. (I will, however, leave town and go to a specific mall where I don't think I'll see anyone shopping in her pajamas, and where I often feel delightfully underdressed.) I will get my triple grande one-pump caramel brulee latte. I will wander in and out of festively decorated stores and pick up a few final gifts. I will enjoy the Christmas music. I will decorate my house a little at a time, until the tree goes up in a couple of weeks. I'll break out my Christmas music. I'll bake cookies. And if someone wishes me "Happy Holidays" I certainly won't snarl at them. The world can't ruin Christmas, because it isn't theirs to ruin. They can't even ruin Advent, which is the actual season of the world's "Christmas" frenzy. We can ruin it for ourselves and our loved ones by getting caught up in the pressure to do, be, and buy too much. I always find it anchoring to attend church during Advent. Not just on Sunday, but midweek, too. And if you are blessed, as I am, to be in a church where there are daily services, attending them can be a great antidote to the pre-Christmas stress that overindulgence of all sorts can bring. It's a good channel for my contrary feelings. It reminds us that this is a season of repentance, anticipation, and preparation. Although a check to Heifer isn't a bad channel for contrarian impulses, either.